The Bureau of Economic Analysis issued its second estimate of real gross domestic product, raising it to +3.2%. Real GDP for 2Q-2016 was +1.4%. Each advance release of GDP data is revised monthly as “more complete source data” is used rather than estimates. We prefer comparing GDP data to the same quarter as the prior year, which helps minimize the variation and possible distortions of seasonal adjustments. Compared to last year, Q3-2016 was +1.6%. 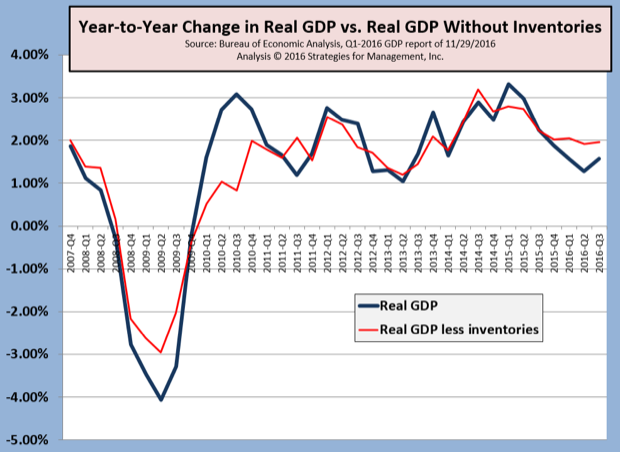 Because inventory changes can distort GDP estimates, we also look at the data less inventories, and it shows the economy still hovering around a +2.0% growth rate. Lately, the inventory adjustments have been small. Theoretically, they should be zero in the long run, and for these last two quarters that has nearly been the case. In 2015, it averaged +$82 billion per quarter. Some of 2016's sluggish performance has been an inventory adjustment in the overall economy. The Atlanta Fed's GDPNow estimate for the current Q4 is running at +2.4%.